Big Foot Moving & Storage, Inc. is a full service moving and storage company. We are proud to provide well-trained and quality movers who will protect your possessions as if they were their own. Expect us to wrap all of your items securely in clean and protective moving pads to avoid scratches and other incidental damage before they are moved. 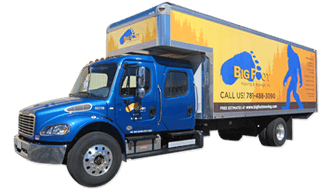 Big Foot Moving & Storage, Inc. operates only clean and late modeled trucks specially designed for and prepared to handle any type of move. Each Big Foot moving truck carries a full line of packing supplies and special equipment to handle the packing and relocation of even the oddest items. A few factors determine the cost of a local move. Local move prices are based on an hourly labor rate which is computed by the number of men and the number of trucks needed to perform the job. This is multiplied by the amount of time it takes the moving crew to drive to your initial residence or office, load the truck, drive to your new address, unload the truck, place your possessions at your discretion, and drive back to our warehouse. The amount of items you wish to relocate and the overall size of your residence will determine your estimate of costs and the number of men you will need. A local move may take a couple of hours or a couple of days, based on the size and the services requested. Local moves have a minimum of two hours. 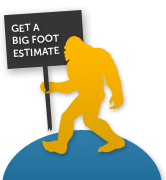 Big Foot Moving & Storage, Inc. will perform your move within your requested time frame. We appreciate the many factors involved in selecting a moving date, such as closing date, lease expiration, family matters, work schedule, and restrictions of building management. Our team is extremely attentive to our customers’ moving time requirements. The chart below will help you get an idea of how many hours and movers it may take for your move. For a more accurate and free estimate, please fill out our online estimate page or call one of our professional relocation consultants at 781-488-3090. Please note: Factors that may effect this chart include: stairs, elevators, long carry, distance between new and old residences, truck parking, packing services and your own uniques size/amount of belongings.